Day 4 of the of the Miami World Cup started as usual, with a series of postponements before the wind agreed everyone could race. The name of the game for the 49er, 49erFX, Nacra 17 and the two RS:X events was to finish the day in the top ten, and book your place in the Medal race on Saturday. By the end of the day it looked like three, possibly four medals were within Britain’s reach on Saturday. 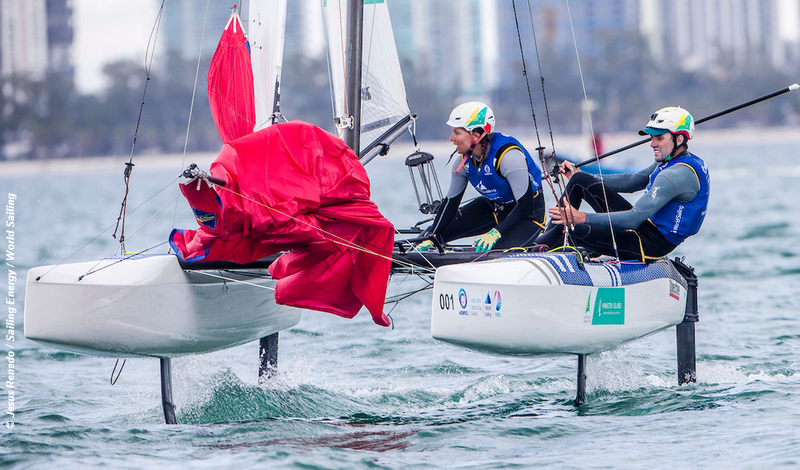 The Nacra17 were first to complete their series races, with Australia’s Jason Waterhouse and Lisa Darmanin topping the leadrboard by four points ahead of Samuel Albrecht and Gabriela Nicolino De Sá of Brazil. Britain’s John Gimson and Anna Burnet are in fifth place, five points off a podium place. In the 49er after 10 races Erik Heil and Thomas Ploessel of Germany lead by 12 points from Dylan Fletcher and Stuart Bethell. James Peters and Fynn Sterritt are in third place, 10 points back, and must hold off Sime and Mihovil Fantela. In the 49erFX, Alexandra Maloney and Molly Meech of New Zealand lead by 12 points after 9 races. Second are Martine Grael and Kahena Kunze of Brazil with Britain’s Charlotte Dobson and Saskia Tidey in third. Sophie Weguelin and Sophie Ainsworth are in fourth place and 20 points off the podium places. In the men’s RS:X, Pawel Tarnowski of Poland leads by five points after 9 races, with Pierre Le Coq of France second and the Swiss Mateo Sanz Lanz is third. In the women’s RS:X, Yunxiu Lu of China leads after 8 races, tied on points with Charline Picon of France and third is Katy Spychakov of Israel. The other classes will continue to race on Saturday to complete their series, with medal races on Sunday. Racing updates as received . . . Provisional.